Peyton Halley '21 passes the ball across the court. On Tuesday, Nov. 20 the JV girls’ basketball took down the Stony Point Tigers with a score of 49-32. 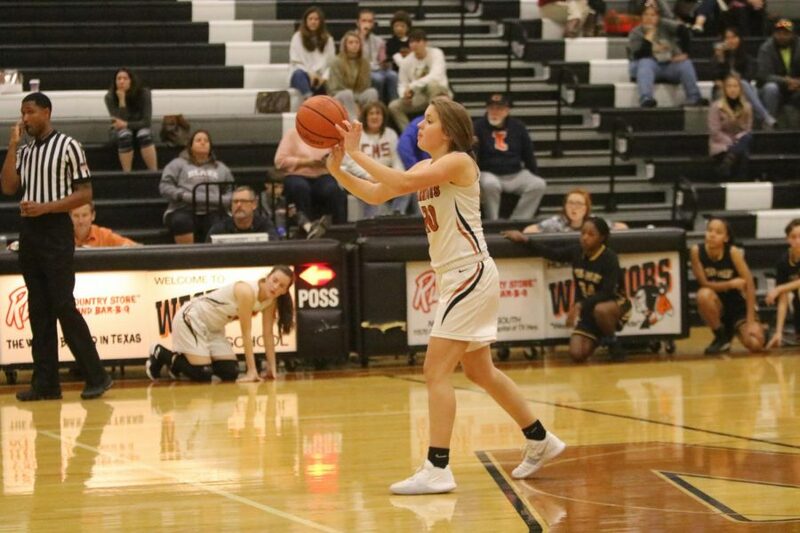 The Warriors started the game with a layup and a three-pointer, but Stony Point retaliated with their own layup, and as they went for a second shot, the ball rebounded and Emma Zion ‘21 scored a three pointer, with Rylee Crider ‘21 scoring another right after. The Warriors were able to score four more points, but also had two fouls, and the Tigers got two more points from free throws, ending the quarter at 16-4, in favor of the Warriors. Two fouls were called on the Warriors at the start of the second quarter, but Zion brings it back after a rebound, taking the score to 16-6 with the Warriors in the lead. Another foul went to the Warriors, and the Tigers got two successful free throws, but refusing to be bested, Megan Luu ‘21 and Zion got four more baskets totaling. To finish the quarter, each team scored a layup in the last 40 seconds ending with a score of 29-12, still in favor of the Warriors. “We did pretty good today for the amount of people we had on the team, because a lot of people are gone due to injuries and vacations,” Luu said. Right after halftime the Tigers began to rack up points and scored twice. Crider scored a three-pointer for the Warriors in the third quarter, and the Lady Warriors also gained 4 points from free throws and a layup. Stony Point finished the quarter with three more layups, but the Warriors kept their lead with a score of 38-23. The Tigers continued their streak with another layup, but they got two fouls in a row, and the Warriors succeeded at one free throw. Stony Point scored, and right after so did the Warriors, the teams continued trading off scoring until Emma Goolsbey ‘21 scored the last basket of the game ending with a score of 49-32 in favor of the Warriors. The Lady Warriors will take on the Vista Ridge Rangers next on Friday, Dec. 7 in the Field House.